Too bad he didn’t say that before he made three trips to the home and charged the homeowner $580 dollars. Maybe it’s a clogged drain line! I’m emptying the drain line manually in the picture above. In this case the drain line wasn’t completely clogged, but draining very slowly. That caused the water to backup in the furnace. The rising water would eventually block the vacuum hose. The furnace would then shut down for lack of vacuum. Eventually the slow draining line would clear and the furnace would run again for a little while, hence the intermittent nature of the problem. This wasn’t a Carrier specific problem that only those with Carrier training could’ve figured out. This was a generic problem that anyone with basic training could’ve figured out. Every single furnace manufacturer makes a furnace like this. It seems that the five star rated Req Tech (who has dozens of rave reviews on Yowl) has not had even the most basic of basic training. Click here for even more wreckage. Req Tech installed this new thermostat. 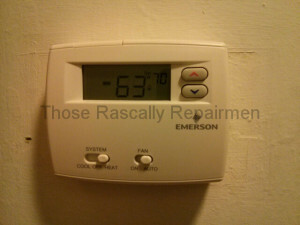 I don’t know why as the symptoms were not indicative of a bad thermostat. The homeowner was a bit suspicious, so she called just a couple hours later and asked where the old thermostat was. According to the homeowner, RT got defensive and said that he had already thrown it away. It wasn’t even three in the afternoon yet. 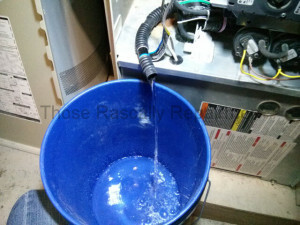 Req Tech also installed a new hose. 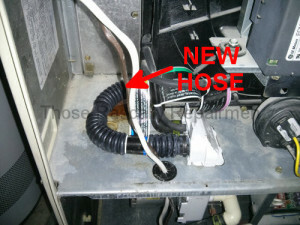 While the symptoms were not indicative of a leaking hose either, at least that was a necessary repair. What wasn’t necessary was making a special trip to get the new hose. He could’ve used the spare sitting to the right. This furnace is designed for upright and horizontal installation. For that reason there are two drain lines. Only one gets used in a particular orientation. The other is, effectively, a spare. As you can see, the top of the spare isn’t connected to anything. Req Tech did not install or even mention the hot surface igniter. This furnace’s igniter was quite old. 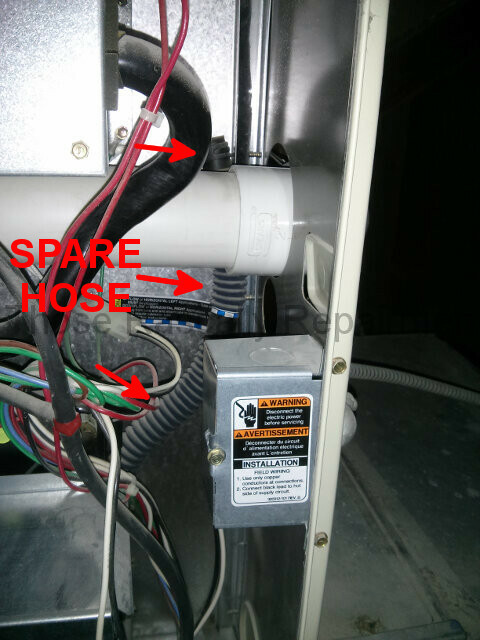 It was the only part on this furnace guaranteed to fail sooner or later, most likely sooner. When a repairman knows that, he should mention it. 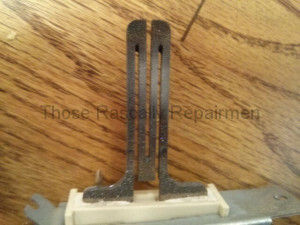 The reported symptoms were also not indicative of a failing igniter. 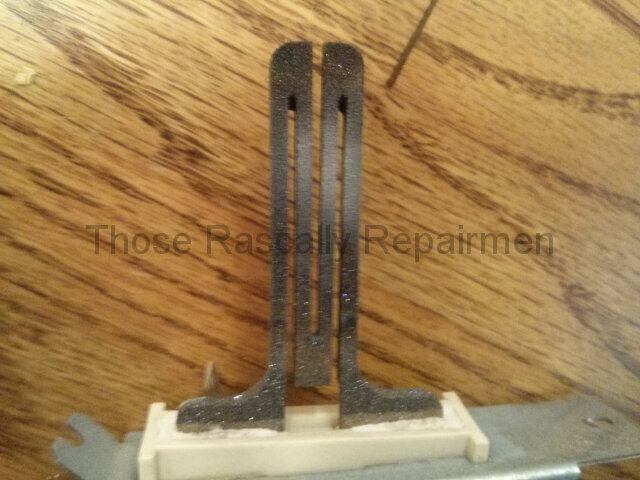 However, unlike the thermostat, this was a useful preemptive repair. The bottom line? Req Tech charged $580 for installing a thermostat that probably wasn’t needed and for a new hose when he could’ve used the spare. None of that solved the real problem. I charged $330 to solve the real problem and replace an igniter that would’ve become a problem.